Kingston is located on the eastern end of Lake Ontario at the beginning of the St. Lawrence River, approximately mid way between Toronto and Montreal. The famous Thousand Islands are just east of Kingston. Growing European exploration in the 17th century and the desire of Europeans to establish a presence close to the local First Nations occupants to control trade lead to the founding of a French trading post & military fort at a site known as Cataraqui in 1673. Fort Cataraqui became a focus for settlement and after the British conquered New France, the village was renamed Kingston. Kingston was named the first capital of the Province of Canada on February 10, 1841. Its time as a political centre was short lived but it remained an important military installation. Archaeological evidence suggests people lived in the Kingston area about 9,000 to 3,000 years ago. The more permanent encampments by First Nations people (The Hurons) began about 500 AD. By the time the French arrived the area was occupied by the Five Nations Iroquois. In the early 1780’s, the area became a receiving centre for Loyalist refugees who fled north because of the American Revolutionary War. During the War of 1812, Kingston was the base for the Lake Ontario division of the Great Lakes British Naval Fleet which engaged in a vigorous arms race with the American fleet based in Sackets Harbour. In the 1840’s, the Upper Canada Government built Fort Henry to guard the entrance to the Rideau Canal. Fort Henry is a popular tourist destination today. Queens University was founded in 1841 and the Royal Military College of Canada was founded in 1876. Another other iconic structure in Kingston is the Penitentiary, established in 1835 and operated until 2013. On Thursday, we woke to a beautiful, but cool sunny morning. At the prearranged time of 0830. the six of us headed off to the Pan Chancho Bakery on Princess Street for lattes and breakfast. What a great bakery. Fran and I enjoyed the blueberry scones with our monstrous lattes and afterwards we picked up a loaf of freshly baked bread. While the crews of Wings and Sir Tugley were heading off on the Trolley Coach “get on, get off” tour of Kingston, Fran and I called long time friends from our Mimico Cruising Days, Ray and Rachel. They had just returned late last night from three days in Rhode Island attending a granddaughter’s graduation. We were thrilled to hear they were game for a get together. Ray and Rachel joined us on Tug’n for a tour and visit. Then we headed off to lunch at Sima Sushi on Princess Street. Wow, what a treat that was. Their Sushi was as good as we’ve had anywhere. 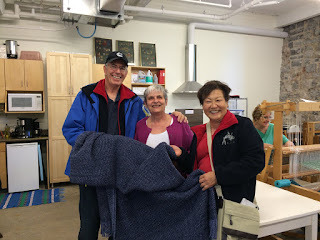 We had such a wonderful time with Ray and Rachel reminiscing about our previous times together, including the 1997 Lake Ontario flotilla of 75 boats that went to Bonavista, Newfoundland to celebrate the 500th anniversary of John Cabot’s landing there. Ray and I participated as crew on a 27’ sailboat for two weeks of that adventure. After lunch, they took us on a tour of Kingston’s Queens University campus as they wanted us to see what had changed since our daughter Ria and her husband Patrick attended in the late 1990’s. We saw the new Smith School of Business and its recently enlarged facility funded by a $50 million donation from an alumnus, the new Isabel Bader Centre for the Performing Arts, the centre for teaching weaving, pottery & music, and much more. Ray is a 1951 grad from Queens Commerce and when we entered the business school building, he found a summer student in the office and convinced her to give us a guided tour. Along the way, we found a hall with photos of Ria and Patrick with their graduating classes from 1999 and 2000 respectively. What a treat! Queens certainly impressed us as a well funded school with amazing alumni support and their gorgeous campus with their limestone buildings are so very well maintained. That wrapped up our great catch up visit with Ray and Rachel. It had been nine years since our last get together and today was indeed a very precious time together. 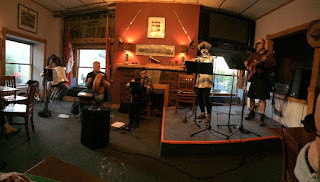 After dinner, we attended a Celtic concert at the Royal Canadian Horse Artillery Club House performed by The Kingston Ceili Band. They had an accordion player, a flautist, a fiddler, an Irish drum player and a guitar player and they sang a wonderful collection of Irish, English & Scottish songs as well as songs by Gordie Lightfoot and Sting. They also handed out songbooks for some sing along songs. An amazing rendition of Oh Danny Boy was sung by a member of the audience. Another member of the audience got up and danced to a great jig played by the band. 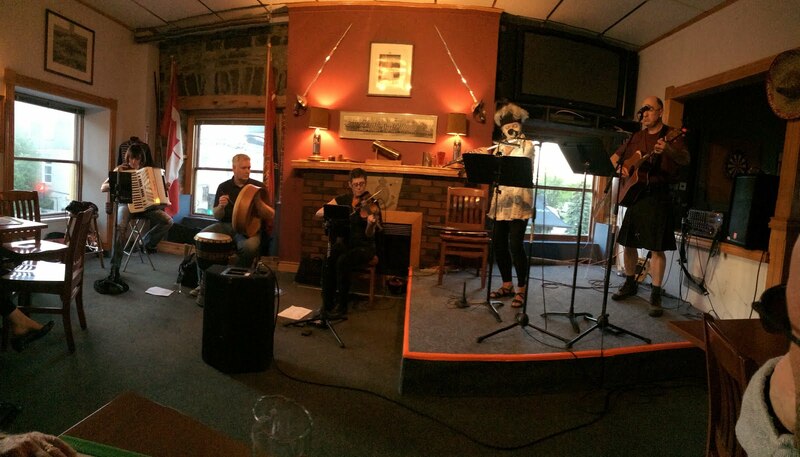 We are hoping we hear a lot more of this type of music in Nova Scotia, Cape Bretton, PEI and Newfoundland. Here’s hoping.